Colliding Forces is a turn-based physics and strategy game that puts you in control of the four elements. Upcoming update at Pax East 2018! There's a new version of Colliding Forces coming with new maps, ui improvements, and a new AI player to practice against! We just released a new version of Colliding Forces including the new WIND ARENA featuring the powerful WIND GUARDIAN, check it out! Download on iOS App Store	and on Google Play! Colliding Forces was selected as one of Ars Technica's "25 indie games that should be on your radar"! "...an intriguing two-player battle of thoughtful positioning and angles"
"You understand it immediately. You understand why there is so much depth and potential in the game." "I was fortunate enough to break away from my booth at PAX East and take a stroll around the indie area, and your game was my favorite by far." 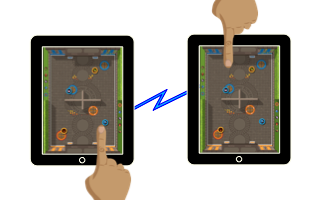 Colliding Forces combines skill and strategy in a simple game you can play anytime with a friend. Each game is about 10 to 15 minutes long. There are four pieces: earth, fire, wind, and water. Each has a distinct ability. Earth generates crystals ( ), which allow you to make more moves on your turn. Fire will destroy any other piece that touches it. Wind pushes other pieces away. Water allows a player to control their opponent's pieces. 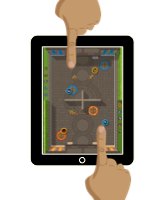 The object of the game is to get one of each element into your opponent's goal. With each element you get a one-time special "finishing move". Finishing moves are very powerful and unique to each element. One example is water's finishing move, "Flood," which allows a player to control all pieces on the board until the end of their turn. The rules are simple but the game play is strategic. Each element can be used in multiple ways which allows you to often surprise your opponent with a clever move. We're hard at work on an online match-making version of Colliding Forces. When it's ready, we will be looking to help cultivate that online community here. Check back soon! Colliding Forces is created in Massachusetts by Mike + Rich Leonardo. We're two brothers on a quest to make games that we love. We hope you love them too! We want to make our games as fun as possible so if you have any ideas, questions, or issues, we really want to know about them.